- all citizens have the right to own firearms... as long as they're vetted like refugees. A threat is a threat. - I want smart and effective national security... a wall doesn't sound like either. -We are too PC... we should say radical Islamists, and Christians and any other denomination that has a portion which commits "righteous" violence. Just don't implicate the entire religion. That's not being PC, that's being accurate. - Lies are bad... they're not "PC" or "alternative facts"
-I'm a white, middle class, middle aged, honest, southern family man... and I've seen 23 executive orders in 3 weeks, none of which will help me. - Trump is our president... and he needs to be held accountable according to your own personal (political, moral, religious, etc) values. I'm now stepping off my soapbox. Peace and Love, Peace and Love. From a friend. I agree with most of it. I can agree with some of that, being pro life is fine, but it is not up to the tax payer to support YOUR child. I personally would be at odds with trump and many other americans as I think the only person who should have a choice is the one who has to carry it for 9 months. If there were people to take every unwanted child then that might not be an issue, but any woman should be able to decide what grows inside her. guns should be available with good vetting of course. but you have it written into your constitution that citizens have a RIGHT to bear arms so that makes it harder for you. that said I dont think criminals care about what laws say or vetting. you cant have good security if people can just walk in. your border then starts at the one in the next country or the country after that or the one after that. A wall, fence or other obstruction may not stop everyone, but it will slow them down far more than an imaginary line on a map. cant disagree at all with you views on violent people. banishment was not such a bad thing in the past. lower taxes are a good thing in my view, but with them should also come reductions in ways to avoid taxes. but the biggest issue should be governments not spending more than they can take it. the tax payer is not a cash cow who can be milked endlessly. Tax evasion is a crime against everyone and should be treated as harshly as possible. Political correctness is a cancer that will ultimately destroy the western way of life. you dont show your tolerance by letting someone kill you. radical islam is one of the most dangerous threats to the western way of life and no matter how people try and wrap it up as it's only a few, those few are measured in their 10's of millions worldwide. Even amongst those who may not be radical as such support for implementing sharia law and islam worldwide is high. I agree fundamentalists of any religion are dangerous, but I am not sure the world is under threat from fundamentalist buddists, hindu's or Christians just yet. I would say that liberals are worse than soft, they are predominantly illiberal these days, they try to shout down any divergence from their own world view and try to destroy those who dare to do so. I would say that your view and my view are not that far apart even if we come at it from opposite sides. You can't force someone to give birth, but you can force them to choose a risky course of action by banning abortion. You can also force an unwanted child to grow up in a hostile, insecure household -- if you feel like you don't have enough criminals already. But there should be more alternatives to abortion, and more education to prevent unwanted pregnancy. Adopting children should be easier. Political correctness is not about letting yourself be killed by a violent terrorist. It's about respecting people who might not be living the sort of life you'd choose for yourself, but are otherwise doing nothing wrong. There are extremists who resort to violence from every religion, from no religion, from every race, from every country, from every sexual identity, from every age group, etc. That tells me violence can't be linked to any group. Maybe we should try something else, because calling "those people" violent doesn't seem to be stopping any violence. 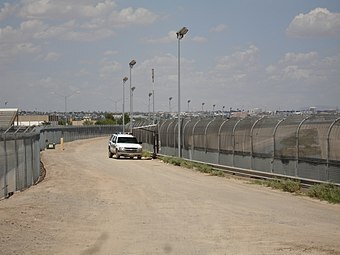 Federal agents who patrol the U.S. border with Mexico want 23 more miles (37 km) of fences, better radios and more aerial drones to tighten the southern frontier, according to an unpublished U.S. government study that influences budget requests. The modest scope of the requirements, details of which were contained in internal emails seen by Reuters and described by Border Patrol officials in interviews, contrasts sharply with calls by Republican presidential candidates for more drastic measures to secure the border. abortion should be the womans choice and hers alone. as to education, yes that's been a resounding success over the last 50 years. It's a great idea, but its not something that hasn't been tried is it. people dont have much control over their lives but they should be able to control what grows in them. isn't there 650 miles of fences of one form or another already. But some places are going to need beefed up security and a physical barrier of some sort works well when there are not patrols around. I understand that parts of the border runs though mountainous terrain which in itself is a natural barrier. there are large numbers of people who cross or attempt to cross every day some of whom may well go back after work. 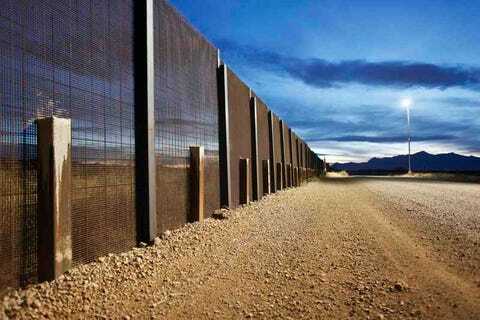 If drones and roving patrols can be beefed up and stop people then that is as good as a wall. there are indeed extremists from all walks of life, but ignoring the fact of Islamic fundamentalism for politically correct reasons is just plain daft. those who demand sharia law where ever they go are the thin edge of a very sharp wedge that eventually leads to your tolerance becoming your downfall. I dont fear every Muslim, far from it, I live a life surrounded by Muslims as a solitary non Muslim voice in the area as far as I know. I receive nothing but pleasantness from everyone I meet and talk to. there are places in the united kingdom where I would not receive that same respect or pleasantness. those places have arisen down to political correctness and a fear of being called racist for speaking out. even in my own home town a few years back I went with my wife to the local Muslim centre because she wanted to find out the ramadam times and I was looked on with something approaching hatred by the person who opened the door, despite, or maybe because my wife is Muslim. and was no doubt viewed as a traitor by that person. there are around 51 islamic country's in the world. quite a lot of them are repressive. turkey wasn't when I arrived 7 years ago but it is becoming more so year by year. women and gays do not do well under in the purely islamic country's. That is not racism, that is islam in its purest form. some people flee those country's for a better life elsewhere, but many leave them to take that life to their new country. it is only a few that are directly involved in terrorism although that few may be around 50million worldwide, but then there is a large number behind that few who support the aims of the caliphate whilst maybe not supporting the way daesh and others go about it. the end result is that those not deemed Muslim end up facing a very troubled time at best or death at worst. you may well have Muslims friends in america, but do you have deep conversations with them about what being Muslim means. No one ignores Islamic Fundamentalism, far more ignore Christian Fundamentalism. it still pollutes our nations politics from the anti gay agenda to Pro-life. To prejudice Muslim bans like trump tried to impose. What is happening is idiots try and say All Muslims are fundamentalist and then say "You're ignoring Islamic fundamentalism" because we have rightfully dismissed their concern as bigotry. they tend to try and use some crap about the koran which they have obviously never read because it says worse in the Bible and even worse in the torah. veya_victaous wrote: No one ignores Islamic Fundamentalism, far more ignore Christian Fundamentalism. it still pollutes our nations politics from the anti gay agenda to Pro-life. To prejudice Muslim bans like trump tried to impose. are they at war with western civilisation., Are they cutting the heads off men women and children filming and posting it on line for their acolytes to lap up. if trump had a Muslim ban then the other 44 Muslim country's must have all converted since jan 20th. it was a ban on people from country's that cannot safely or accurately vet those who wanted to come to america. it was based on a list of country's created by the obama administration. in my view saudi and other gulf states and pakistan should have been on the list as they do oppress women and gay folks, but that does not seem to matter at all to the people protesting so much. however I also understand the term realpolitik and can see why we would not want the saudis and the rest of the middle east to fall under russian influence or lose the oil that the west so desperately needs to continue. they have already lost the eastern med to russia. YES they are at war with secular western ideals and they do shoot people in western nations with far more regularity that Islamists do. And how does it matter? one can argue that THEY are the ones pushing the west to unreasonable action over Islam which predates Islamic opposition to the west. We need to sever all relations with ANY religion in line with the secular ideals that have given the west what we have today. And also then we can truly claim that the west didn't attack Islam first. and as I always I propose a superior system.